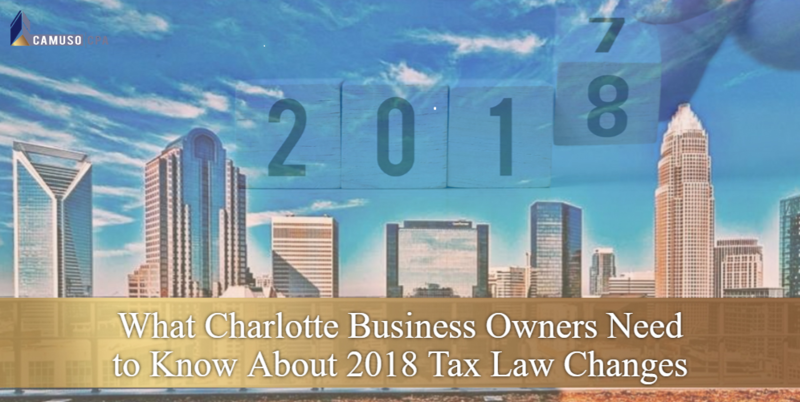 Here at Camuso CPA, we offer a wide array of tax services for small business owners in Charlotte including tax preparation and tax planning. Financial service and technology companies are transitioning from employee driven revenue models to information driven revenue models. Camuso CPA strives to deliver useful insights and offer relevant explanations about the latest tax and financial topics. Be sure to contact our team today for any immediate tax needs or questions. On 22 December 2017, the President signed tax reform legislation known as the Tax Cuts and Jobs Act (TCJA). While the full implications of the Tax Cuts and Jobs Act are still unraveling, a number of tax-planning opportunities have presented themselves. Here we will outline how these changes impact small business owners. The new corporate tax rate is 21 percent. And this change will live on past 2025, which is when most of the other tax-law changes are set to expire. The new rate is also a flat tax, meaning it’s the same for all C corporations — that’s different from the previous corporate tax rates, which were 15, 25, 34 and 35 percent. Similar to the individual alternative minimum tax, corporate AMT was an additional way to calculate taxes to help ensure corporations paid a minimum amount of tax. Eliminating the corporate AMT also means getting rid of some of the tax liabilities for corporations that used to factor into the AMT calculation. The Tax Cuts and Jobs Act (TCJA). This is primarily known for reducing corporate tax rates to 21%, but the new Section 199A provides non-corporate taxpayers with a potential 20% deduction against taxable income, which, when applicable, effectively discounts the maximum 37% non-corporate rate to 29.6%. The 20% discount requires a complicated formulaic deduction equal to: (1) 20% of newly defined qualified business income plus (2) 20% of the sum of (a) REIT dividends and (b) publicly traded partnership income. For taxpayers with income over certain minimal thresholds, the 20% of qualified business income deduction is limited to the greater of: (a) 50% of the W-2 wages paid by the qualified business, or (b) 25% of the W-2 wages paid by the qualified business, plus 2.5% of the unadjusted basis of depreciable property held by the business. Taxpayers should consider evaluating the choice of entity used to operate their businesses. The 21-percent reduced corporate tax rate may increase the popularity of corporations. However, factors such as the new 20-percent deduction for pass-through income, expected use of after-tax cash earnings, and potential exit values will significantly complicate these analyses. The potential after-tax cash benefits ultimately realized by owners could make choice-of-entity determinations one of the most important decision taxpayers will now make. Previously, businesses were able to offset current taxable income by claiming net operating losses (NOLs), generally eligible for a two-year carryback and 20-year carryforward. Now NOLs for tax years ending after 2017 cannot be carried back, but can be indefinitely carried forward. In addition, NOLs for tax years beginning in 2018 will be subject to an 80-percent limitation. Companies will have to track their NOLs in different buckets and consider cost recovery strategy on depreciable assets in applying the 80-percent limitation. 2018 will see the first significant tax reform since 1986. This reform affects everything in the economy as well as everyone in the country. The ways it will affect individuals, couples, corporations and small business owners will vary, but everyone will see changes in 2018. If you are searching for local CPA firms in Charlotte to assist you with taxes, contact Camuso CPA. Whether you need tax preparation services, personal or business tax planning for the new tax law changes, Camuso CPA can help.